Skateboarding’s acceptance as a mainstream sport is moving faster than ever, and if steered from within, stands to take the sport and the industry to all-new heights. Skateboarding is televised more than three times the amount it was four years ago, and is captivating the attention of more people today than ever before. With the 1995 inception of ESPN’s Extreme Games, as they were originally dubbed, skateboarding entered the homes of millions on an annual basis in the form of vert and street events. Seventeen years later, the X Games now hosts eight different skateboard disciplines. Street League’s domestic broadcasts via ESPN received more than two million viewers during its first year, while airing internationally in more than 198 countries. 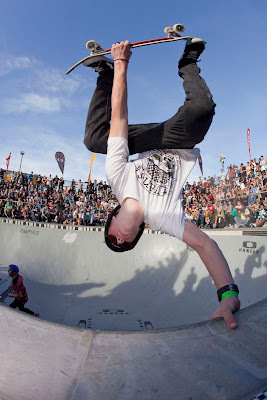 The major skateboarding contests are The Dew Tour, The Maloof Money Cup, The X-Games, The Tampa Pro, Street league Skateboarding, and all the contests of the World Cup Skateboarding (WCS), including the Bowl Series, not only in the USA but in Europe, France, Italy, New Zealand and Australia.